Whether you use your garage as a workshop, extra living space, or simply want your car to start on the first try, a warm garage is an underrated luxury. When it comes to heating your garage when the temperatures outside take a dip, there are more options to choose from than you probably imagine. As the best way to heat a garage in the winter can vary based on location and personal budget, the following options are designed to help you choose what’s best for you. On the most basic level, a garage can be treated as any living space. True, you don’t need it to be a cozy 68-74 degrees, but proper environmental control begins with the ability to keep a constant temperature range. The following are some common methods that’ll help keep your garage or workshop comfortable in even the coldest weather. This might at first sound like it fits into the “duh” factor, but a fully insulated garage isn’t just a matter of slapping on some fiberglass batt insulation and covering it with panels of drywall or plywood. It also means ensuring the entire garage is sealed from cracks and drafts. Further prepping your garage for winter means you’ll want to either weatherproof your garage door or purchase an insulated garage door. Having a fully insulated garage means it’s sealed from all but the worst temperatures, making it far easier to maintain livable conditions. A detached garage will benefit the most, as it faces exposure to the elements on multiple sides without the benefit of heat from your home. There are a wide range of heating unit options, from convection heaters and space heaters to full-size units. The key here is to buy a unit that’s sized for your garage space so you’re not putting out too much or little heat. Space heaters are generally the cheapest way, since you likely already own one, but these are only good for short-term warming due to their generally high running cost. When you need to heat a garage in the winter but still have the option available year-round, the best choice is an actual garage heater. 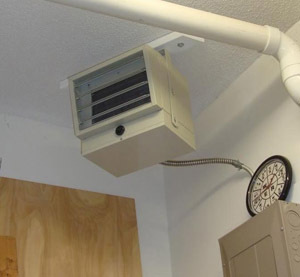 Functioning much like your AC units, these are permanently installed near the ceiling and can heat even large garages. Unlike the other options in this list, infrared heating is designed to warm specific areas, such as a workspace. The infrared mats can be used to heat an existing garage floor, allowing you to work under the car in more comfort. Meanwhile, the cable version functions much like an old-fashioned wire space heater, but warms your equipment before it does the air itself. Both types of infrared heater are energy efficient and work great for their intended task. One of the worst culprits of a cold garage is the concrete. This substance is terrible at holding heat, but adding a floor covering may not be possible for your garage’s particular purpose. One solution, albeit costly, is to rip up the concrete and replace it with a heated floor. 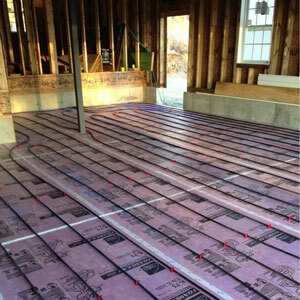 Heated floors use a base layer of filler sand covered by a reflective liner. Next, flexible piping is installed in loops and concrete is poured on top to finish the floor. A boiler is used to heat the pipes. Unfortunately, installing the heated garage floor is a delicate project which most often requires hiring a professional and therefore is easily the most costly solution on this list. Beyond what you’d expect to find for heating, there are some unusual alternatives worth looking into. These options tend to be highly cost-efficient and make use of technologies that you likely have never heard of. When looking for something on a lower budget, these can be real lifesavers. 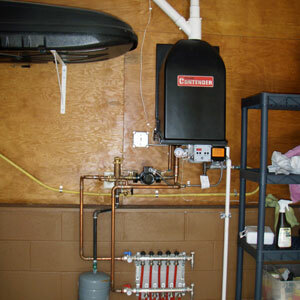 A water heater to keep the garage warm? Hear us out on this one! ModCon boilers are a form of tankless water heater which doubles as a space heater without either function affecting the other. Place one of these in your attached garage to pipe hot water into the house as needed and keep even a large, multi-bay garage toasty warm. This option requires an initial investment, but since the annual energy and water savings more than pay off the cost, it may well be the most efficient way we can think of to heat the garage. The best part about a combination boiler is that it can be used to for a heated floor in a detached garage to save on the cost of a boiler. 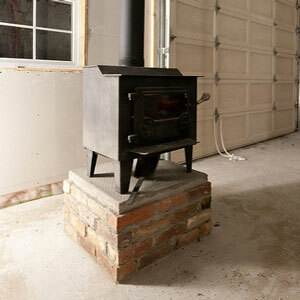 One potential method for heating a finished garage might not have crossed your mind. Electric ceiling panels are one-inch thick rectangles that heat up and cool off quickly, allowing safe and efficient temperature control. They’re also rather attractive in their simplicity, allowing them to add shape without hinting at the function. The downside if you cover a large ceiling area is your electric bill will likely have a sharp increase if you leave them on for long stretches of time. But for mounting only over an area you’ll use a lot (ie: workbench), they’re a great option. An old trend that’s becoming popular again, heating a room (including a garage) with a wood burning stove can be a pleasant experience. Soapstone fireplaces are another more obscure variant that also provides plenty of visual appeal. Just be warned: Using a stove or fireplace to heat the garage may result in it becoming a secondary family room, so if you like to work alone, it’s something to consider. Note: While every garage should have some type of fire extinguisher, it’s even more important when you’re burning wood inside of it. Another unusual option is a very old “technology” mainly used today among survival enthusiasts and those living off the grid. Certain stones or minerals absorb heat, radiating it back out into the environment. When placed in a sealed, well-insulated garage, they can be enough to maintain an above-freezing temperature on their own. As the stones don’t require power but are not as efficient as powered alternatives, it’s best to save this option for garages without electricity. Soapstone – This super-dense stone can be baked in an oven or placed in a fire without a risk of exploding. It can then be placed in the garage to help keep it warm throughout the night. Note that soapstone fireplaces are a popular way to keep rooms warm long after the fire has died out. Learn more about using soapstone here. Sodium Sulfate – This common substance is used in heating tiles and liquifies in only 90 degrees. The process of solidifying again radiates the stored heat, making this an excellent eco-friendly option when stored in solar-heated cells or against hot water supplies.